Venus fully enters the sun's disk in this view of the June 5, 2012 Venus transit from a telescope atop Mauna Kea, Hawaii, during a NASA webcast. Venus appears at lower left, a position created by the telescope itself. Venus was actually at upper left at the time. NEW YORK — It's finally here! The historic transit of Venus, the skywatching event of the year, has begun. The planet Venus has started its nearly seven-hour trek across the face of the sun. Today is the last time Earthlings will see such a view until 2117. The Venus transit officially began today (June 5) just after 6 p.m. EDT (2200 GMT), and will last six hours and 40 minutes. The planet Venus (upper left) approaches the sun for a rare solar transit on June 5, 2012. This image was captured by NASA's Solar Dynamics Observatory. Venus will look like a small black disk as it crosses the bright sun, which can be viewed only with protective eyewear. The sight is visible from North America, Europe, Asia and eastern Africa. Because of the International Date Line, some parts of the world are witnessing the transit on June 6. "It is the rarest predictable astronomical event," wrote astronomer C. Alex Young, a sun expert and astrophysicist at NASA's Goddard Space Flight Center in Greenbelt, Md., on his blog The Sun Today. "It only happens 4 times every 234 years!" 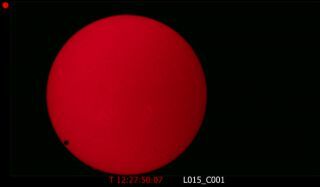 This view from the Slooh Space Camera shows the amazing start of the 2012 transit of Venus across the sun (upper left) as it begins to cross the solar disk on June 5, 2012. The first transit observed by humans and documented was in 1639. In the intervening years, scientists have utilized the rare transits of Venus to measure the absolute distances to Venus and the sun, and to discover Venus' atmosphere. Now, scientists will be training the eyes of multiple telescopes, including NASA's Solar Dynamics Observatory in orbit and many on the world's tallest mountains, on the sight. This time around, researchers hope to learn more about Venus' atmosphere, as well as test techniques to discover alien planets by looking for signs of them transiting their stars. Skywatchers can view today's transit through special glasses equipped with solar filters, through pinhole projectors, or with #14 welder's lenses. Telescopes with solar filters can also provide a great view. Neither the naked eye, nor binoculars or telescopes, should be pointed toward the sun at any time without a filter in place. Veteran space photographers Imelda Joson and Edwin Aguirre of Boston, Mass., have ventured to the Los Angeles area in California in order to photograph the transit of Venus. The photographers and occasional SPACE.com contributor writers report near pristine viewing conditions at their chosen observing spot: Hermosa Beach. "It's blue skies here in Los Angeles and a lot of people are aware of the transit," Joson told SPACE.com, adding that she and Aguirre, her husband, are using the same cameras they used to document the 2004 Venus transit. Joson and Aguirre are eagerly awaiting a special moment during today 's event when the sun slips down close to the horizon. They hope to capture the moment of sunset with Venus' silhouette on the sun. "That's the reason we chose the beach here," Joson said. Here in New York City, the American Museum of Natural History will host a webcast from an observatory atop Mauna Kea, Hawaii, while the Amateur Astronomers Association of New York has set up two observing posts along the city's west side, weather permitting, and invited the public observe the transit. Organizers are hoping for a break in a persistent cloud layer today to observe at least some of the transit before the sun sets. A large crowd turned out to view the transit of Venus at the American Museum of Natural History in New York, where astronomer Steve Beyer explained what the crowd was going to see. In San Francisco, the Exploratorium will host its own webcast also with views from Hawaii's Mauna Loa observatory, as well as a local transit-observing event. Meanwhile, scientists at NASA's Ames Research Center in nearby Moffett Field will discuss how the Venus transit can help astronomers discover alien planets around distant stars. Our senior writer Mike Wall will be covering the Ames event for SPACE.com. "It's a sunny, clear day in San Francisco, and I'm hoping conditions are similar at NASA's Ames Research Center in Moffett Field, which lies about 40 miles south. You can never take the sunshine for granted here in the Bay Area," Wall said before the transit began. At-home viewers can also watch any of the multiple webcasts being broadcast online by telescopes around the world. Click here for a full list of Venus transit webcasts. Editor's Note: SPACE.com will be posting updates and pictures of the transit as it progresses. If you snap photos of the 2012 transit of Venus across the sun and would like to share them with SPACE.com, send images and comments to managing editor Tariq Malik at: tmalik@space.com.